Are you looking to relocate to Durban? Whether you’re moving a large business or are an individual looking for movers in Durban to help your family settle – Stuttaford Van Lines got you covered with a range of tailor-made services. We take charge of all the details involving the relocation of your valuables, vehicles and other precious items while you get to enjoy the gentle subtropical climate and vast beaches. The KwaZulu-Natal coast is a prime location in South Africa. Durban is not only one of the country’s tourism centres, but its busy economy also attracts many new residents each year who relocate to one of its lush and sunny suburbs. With the help of one of the most reputable and organised removal companies in Durban, the experience can be seamless, stress-free and simplified. Established more than 150 years ago, Stuttaford Van Lines boasts the largest fleet in South Africa, with a network of branches that spans the entire country. With a wealth of experience and knowledge, we are able to ensure that your valuable possessions are packed perfectly and delivered to your destination of choice safely and on time – with a track record to prove it. In addition, we offer pet relocation services to ensure that your beloved animals are comfortable and cared for throughout their journey, as well as vehicle relocation and long or short term storage options. Our innovative packaging and storage solutions make us one of the most sophisticated moving companies in Durban, and no matter what you need transported, whether large or small, we’ll ensure it is protected, packed and arranged in a way that will ensure it reaches its destination safely. 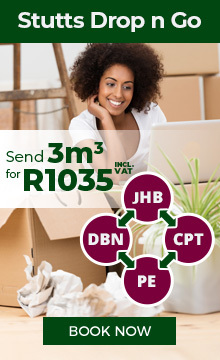 Speak to one of our consultants today about moving to Durban or visit our branch page. Stuttaford Van Lines offers the attention to detail you deserve.